The Tron Foundation has recently released the expansion plan of its secondary scaling solution, the ‘Sun Network’. The Sun Network is a system update that plans to improve Tron’s efficiency by introducing dApp sidechains and interoperable cross-chain features. By doing so, the Foundation claims that this will ‘improve the overall TPS’ as well as reduce the energy consumption of dApps. The deployment of the Sun Network has been broken down into 3 phases spread out over the next 5 months.The Sun Network testnet launch, scheduled to go live on May 30, will be the first phase, followed later on in the year by the official launch and optimization stages due on August 10, and September 15 respectively. The new announcement has arrived at a fortunate time just as Bitcoin and a vast majority of altcoins correct from the recent bull market. TRX is currently the best performing asset among the top 30 cryptocurrencies today with a 7.12% gain against the US dollar and a 7.76% lead over Bitcoin. 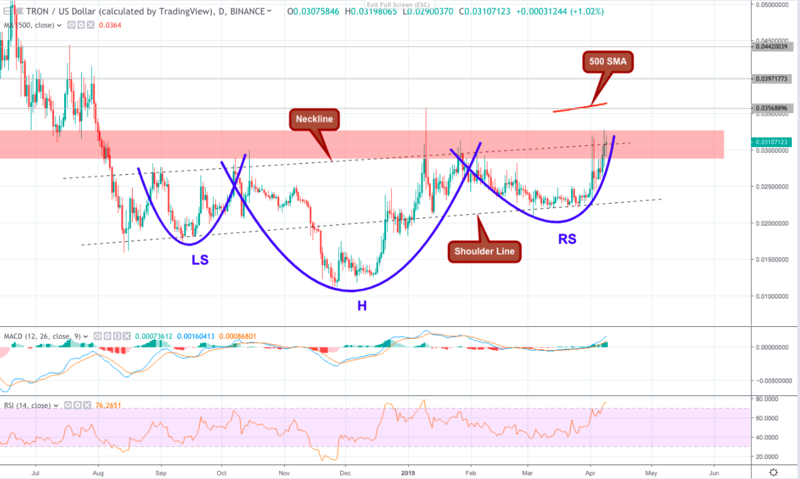 Looking at the 1D TRX/USD chart (below) we can see that Tron appears to have finally completed a 7-month long inverse head and shoulders (H&S) pattern, as the right shoulder (RS) retraces back to the neckline at $0.0304. Inverse H&S patterns are characterised by two parabolas (LS, RS) that stand either side of a much larger downtrend (H). On each occasion, the 3 sell-offs pull back to the same retracement level - known as the neckline - and are typically followed by a strong breakout. The neckline does not always have to be horizontal, and usually when an inverse H&S rises it can foreshadow a stronger breakout. Similarly, a sloping regular H&S pattern usually signals the start of a very bearish episode. Right now we are waiting to see further confirmations that TRX is about to break bullish. So far, the price action has managed to close above $0.03 for the first time since August, 2018; rising parabolically since finding the bottom on March 27 at $0.0244. TRX is well into the overbought region on the RSI, at 73%. On the MACD indicator, the 12MA is also pulling well away from the 26MA as short-term buying momentum soars. Parabolic SAR dots have also recently started to reappear beneath the price action again, after a brief period of bearish activity. This is another promising signal that bullish momentum is continuing to build behind the asset. If candles start to close above the neckline and breach the first main resistance zone (red shaded area) at $0.0327, then we should expect the breakout to be underway. All ROIs are calculated from the asset’s current value at $0.0302. The opening breakout target is likely to be around the $0.0356 level, which sits comfortably near the 500-day SMA. This resisting level is likely to be a strong initial test for bullish TRX traders and could force the price action to throwback on to the neckline as a temporary support, before launching a second impulse movement. The second price target will be the psychological $0.04 mark which historically has been a difficult price point for TRX to overcome in the past. This target was also a strong resisting level for TRX, particularly around June/ July of last year. If Tron breaks clear of this level it will set a new 9-month high.